Only a day after gay blogs reported bills to legalize marriage equality in Rhode Island were introduced by openly gay House Speaker Gordon Fox (Woohoo! 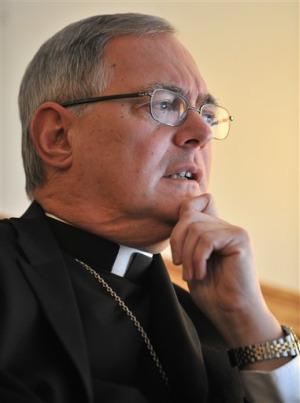 ), Roman Catholic Bishop Thomas J. Tobin is getting all stank about it to reporters. Hush, man. Jesus loves. “It is particularly disturbing that our new governor, who has trumpeted his desire to bring our state together in unity, would adopt such a very divisive agenda item as one of his first priorities,” says Tobin. Because discrimination is more unifying than granting equal rights to all citizens. Riiiiiight. Honestly, the members of the Catholic Church are the only ones even drinking their own Koolaid these days. This story is almost a non-story in its predictability. Cash money says sanity prevails in Rhode Island, and marriage equality goes into effect. Some borderline hate-group under the guise of a statewide coalition quietly funded by the Catholic and Mormon Churches will inevitably appeal the decision, it will go back and forth in the courts for three years, and ultimately gays and lesbians will walk away with the rights to marry and adopt that they’ve been denied for so long. This guy, and his prejudices, will be a dinosaur soon enough. Hang in there. What do you think of the Bishop’s bigotry?